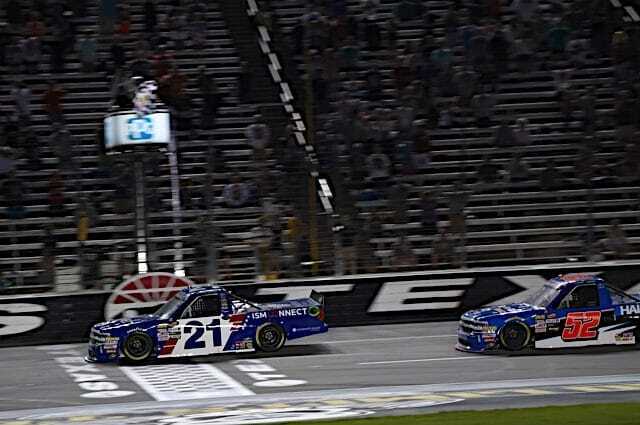 In a Nutshell: Johnny Sauter scored his fourth win of the 2018 season when he beat poles-itter Stewart Friesen to the checkered flag by 0.092 seconds in the Camping World Truck Series’ closest finish at Texas Motor Speedway. The driver of the No. 21 led for the final 51 laps to score his fifth victory at the mile-and-a-half track in the PPG 400. Justin Haley, Grant Enfinger and Matt Crafton rounded out the top five. Who Should Have Won: Sauter and Todd Gilliland were easily the class of the field once the green flag flew. The pair combined to lead 113 of 167 laps, and even engaged in a spirited battle for the lead early. But when it mattered most, it was the veteran experience that allowed Sauter, who actually ran out of gas on the final lap and had to re-fire the truck, to take his fourth win on the season. As usual, the Truck Series’ rookie battle is deep with talent, and some of that talent ended up coming together on the track. It didn’t end well, though, as contact between Dalton Sargeant and Myatt Snider sent the No. 13 truck spinning into Jennifer Jo Cobb. Both Cobb and Snider’s trucks were destroyed and each driver had to take the mandatory ride to the infield care center. YELLOW! A multi-truck incident unfolds entering Turn 3. Snider called it “hard racing” and cited the rookie battle the two are involved in. Sargeant ended up 11th after starting at the rear of the field due to unapproved adjustments. Snider and Cobb ended up 23rd and 24th, respectively. For the fourth time in five years, Texas Motor Speedway handed out a high school diploma. The fun tradition began with Erik Jones and later included Cole Custer and Noah Gragson. Now, you can add Gilliland’s name to that list. When it came time to race, Gilliland started seventh and was easily the class of the field early in the event, leading a race-high 62 circuits, blowing away his previous high of a single lap led at Martinsville earlier in the year. When all was said and done, the driver of the No. 4 Toyota walked away with his best result of the season in sixth. The sixth-place finish marks his third in four starts this season and his second consecutive in two mile-and-a-half starts. Gilliland sits 15th in the standings, 106 points behind Haley, who currently sits in the playoff cutoff position in eighth. He will need a win if he’s going to make the playoff field this season, and the way he’s driven in the two races since he turned 18, that win will come at some point this year. With his win Friday night, Sauter becomes just the third driver to win four of the first eight races in a season. He’s in elite company, joining Kyle Busch and Mike Skinner. Additionally, the finish was the closest in series history at Texas Motor Speedway. For the second time in his career, Friesen started on the pole, narrowly edging Gilliland. He led the first lap but a loose truck sent him sliding backward a bit. By the time the checkered flag flew, Friesen had recovered to lead 13 laps and brought home his second career runner-up finish. “I just have to thank Halmar International for giving me the opportunity to race at this level and Chevrolet for all of the support over the offseason,” Friesen said. “The GMS fab shop is second-to-none. Me and Justin [Hale] and Johnny [Sauter] raced our heads off there at the end, and that was pretty fun. In just his second start with the team, DGR-CROSLEY driver Chris Eggleston stole the show Thursday when he led the lone practice session from Texas. He followed it up with a sixth-place starting position on Friday. Eggleston got trapped a lap down when attempted pit strategy backfired and he was forced to hit pit road under green flag conditions. When the checkered flag flew, he lined up 14th, marking his second top-15 finish in as many races with the organization. Wendell Chavous matched his career-best finish of 12th at Texas Motor Speedway after starting 19th. He also brought home a 12th-place result at Daytona International Speedway in the season-opener earlier this year. Premium Motorsports announced Thursday evening that Robby Lyons, driver of the No. 15 Chevrolet was under the weather and would not be racing at Texas. In his place, Reed Sorenson hopped behind the wheel. With zero practice time, the replacement driver had to start 29th when he made the field on owner points. But once the green flag flew, Sorenson ran just 15 laps before taking the truck to the garage, citing overheating issues. He finished 27th. With new sponsors in Sefton Steel and the Mark Martin Podcast, Jordan Anderson put together what looked like his best intermediate race to date. But with 10 laps remaining, he got into the outside wall and smoke billowed from the back of the No. 3 Chevrolet. Anderson had been running 12th at the time and was relegated to a 19th-place finish. The culprit for the smoke? Speculation before the team left the track was a broken oil line. Tyler Young made his first 2018 start at Texas Motor Speedway. After running 19th-quickest in practice on Thursday, he qualified 20th for the PPG 400. But when the checkered flag flew, Young walked away with a seventh-place finish. It marked his sixth career top-10 result, and only his third on a non-restrictor plate track. Points Update: A fourth victory in eight races helped Sauter expand his point lead to 77 over second-place Noah Gragson. Brett Moffitt sits third and holds a slim one-point advantage over Enfinger. Crafton rounds out the top five, 99 markers behind the leader. Ben Rhodes sits sixth, followed by Friesen and Justin Haley. Sargeant and Snider round out the top 10. Sauter now holds 22 playoff points that he’ll to take with him all through the playoffs, and his second closest competition, Gragson, has tallied 10 so far. Moffitt sits a distant third with six playoff points. Rhodes and Enfinger have two apiece, while Enfinger notched his first one Friday night. Good recovery and overall good night for our @ProtectHarvest F-150. Great effort by all of the guys @ThorSportRacing bringing good stuff to the track every week! Can’t wait to get to Iowa! Up Next: The Camping World Truck Series heads north to Iowa Speedway for an XFINITY Series companion weekend next Saturday night. Coverage for the M&M’s 200 presented by Casey’s General Store begins at 6:30 p.m. ET on FOX Sports 1; the race can also be heard on your local MRN affiliate or SiriusXM NASCAR Channel 90.